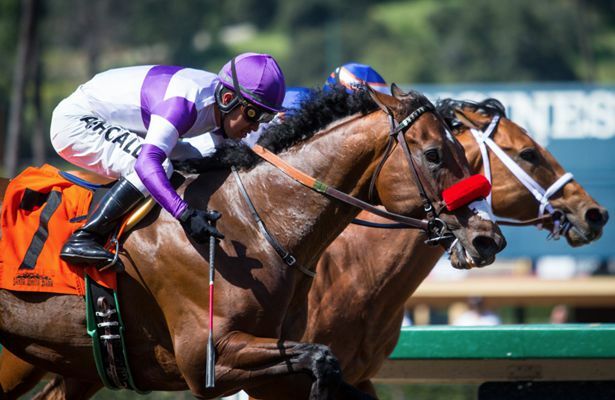 Reddam Racing’s homebred B Squared parlayed his outside post position into a thrilling neck victory over favored Tough Sunday in Saturday’s $100,000 Thor’s Echo Handicap for Golden State Series eligible three year olds and up at Santa Anita. Ridden by Mario Gutierrez and trained by Doug O’Neill, the 4-year-old California-bred colt by Square Eddie got six furlongs in 1:10.09. Breaking on top in field of five, B Squared settled nicely in third, just off Tough Sunday and longshot Make It a Triple as the field motored to the far turn. A half length off the lead while three-deep at the quarter pole, B Squared kept to his task and overtook an extra-game Tough Sunday right on the money. Most recently sixth on a muddy track versus state breds going 6 ½ furlongs in the Sensational Star Stakes here on March 11, B Squared was the third choice at 7-2 and paid $9.20, $3.40 and $2.80. Out of Reddam’s Ten Most Wanted mare Silar Rules, B Squared notched his third stakes win and improved his overall mark to 15-4-3-2. With the winner’s share of $60,000, he increased his earnings to $347,128. Heavily favored Tough Sunday broke a step slow from the rail and had to contend with a tenacious Make It a Triple to the top of the lane and just missed in a heartbreaker under Joe Talamo. Off at 3-5, Tough Sunday finished 1 ¼ lengths clear of Make It a Triple and paid $2.80 and $2.10. Ridden by Edwin Maldonado, Make It a Triple, who finished 1 ½ lengths in front of Smokey Image, was off at 9-1 and paid $2.80 to show. Fractions on the race were 22.42, 45.59 and 57.42.